Hey look, Exfm is like Ping, but useful! 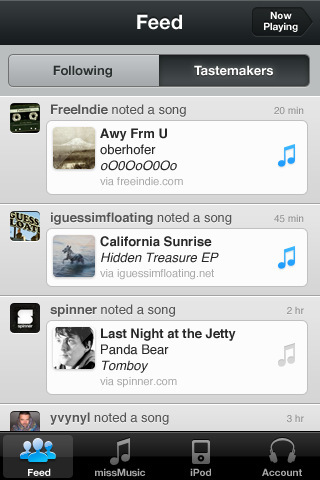 A new iPhone (s aapl) app released on Thursday brings a music social network to the iPhone. Not for the first time, mind you, but it does get a lot of things right that previous offerings, including Apple’s own Ping, haven’t been able to nail down. Exfm is the free iPhone client for an existing service that started life off as ExtensionFM, a Chrome (s goog) extension that lets you grab and build playlists out of free MP3s posted to blogs. It also lets you both listen to those and share them on Twitter, Facebook and other social networks. The iOS app doesn’t let you collect music tracks itself, but it does grab songs you mark as “noted” using the Chrome extension, letting you play them back on your iPhone via streaming over Wi-Fi and 3G. Exfm scratches a couple of itches that Ping doesn’t: It doesn’t depend entirely on users having a strong network to function, since it gathers tracks for your consideration from music blogs, and it also actually lets you play music from your built-in iPod app and “note” those songs, which means you can share your musical tastes with your social network contacts as you listen. One of Ping’s greatest weaknesses is that it doesn’t plug in to a user’s actual music library or let her use it easily while she’s listening to music. If I have to go to my library, find the track I’m hearing, and mark it as Liked in the desktop version of iTunes, most of the time I’m not going to bother. If, on the other hand, I can just unlock my iPhone (where I do the vast majority of my music listening, anyway) and, using a single tap, recommend a track, I’m much more likely to participate. To be fair, Apple did introduce the ability to Like and post comments about songs in the iPod app in iOS 4.3, but it works with tracks purchased from the iTunes Store, which leaves a lot of uncovered ground for many users. Exfm works with anything in your library, and it connects you to Facebook, Twitter and Last.fm friends in addition to those who also use Exfm. Apple partnering with Twitter to make iOS more generally social is a good idea. If Exfm’s early efforts with its iPhone app are any indication, Cupertino should think about cutting its losses with Ping and teaming up with theses guys to shore up that side of its mobile business, too.